The wake-sleep cycle is dictated by the circadian rhythm (light – dark cycle). Sleep evolves continuously in a regular succession of five phases or stages. The first four stages constitute a period “without rapid eye movement” called Non-Rapid Eye Movement sleep or NREM sleep. The fifth stage is characterized by Rapid Eye Movement (REM sleep), also called “paradoxical sleep” because of its resemblance with wakefulness. During stages 1 & 2, one falls asleep, but is not yet in a deep sleep. Stages 3 & 4 are characterized by a deep sleep, during which breathing and heart rate slow down and the body is still. Stage 5 shows brain activity and one is dreaming. The phase of deep, refreshing sleep depends on the complex action of multiple neurotransmitters that will be produced throughout the night. A sleep disorder is a medical condition in which the sleep patterns described above are altered. It can affect a person’s emotional balance, energy, productivity, and health. Using state-of-the-art knowledge and technologies in the domain of micronutrition and nutritional genomics, SwissNovaGene has conceived and developed an efficient combinatorial ingredient, SLEEP for restoring quality sleep without any side effect. SLEEP can be used in monotherapy or in combination with other therapeutic approaches for the treatment of sleep disorders. 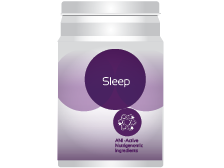 Controlled clinical studies demonstrate a significant aptitude of SLEEP to decrease symptoms of sleep disorders and sleeping problems by 42 % within 4 weeks. Remarkably, SLEEP was able to fully eliminate sleep disorders in 17.5% of the examined cases. EEG (electroencephalography) recordings show that SLEEP increases the duration of deep sleep, due to longer sleep episodes and hence, increases sleep quality. The amelioration of quality sleep observed in the clinical studies corresponds to an increased general daytime vitality through suppression of sleepiness and low energy state during the day, which are the most uncomfortable consequences of sleep disorders for the patient.